Amazon called this year’s Prime Day the “biggest day ever” for the company. Amazon has been fueling shopping behavior with Alexa by providing exclusive deals and additional discounts. A clever way to get people to start using their Alexa devices for shopping. An important perspective to keep in mind is that Amazon created this “holiday” out of thin air a year ago, and so far Amazon has replicated the success of last year and grown pretty substantially internationally. Also this year, the search behavior has changed. Last year, when you clicked on a Prime Day promotion, you saw 5-10 results of Prime deals and then normal non-deal Amazon listings. This year, when you click on a Prime Day promotion, a filter is applied and all you see are Prime Day deals. This filter could be minimizing the spillover to non-Amazon sellers. As a reminder, there are two ways products are sold on Amazon – 1P or first party where Amazon is the retailer and 3P, or third party, where a third party seller or what Amazon calls ‘sellers’ or ‘small businesses’. While Amazon expanded the number of 3P offers this year, they are still the minority of both the number of deals that are run as well as the transactional volume or GMV. At ChannelAdvisor, the bulk of our GMV flows through the 3P system, or sellers, so we don’t ‘see’ the 1P sales. Wider and deeper deals- Last year the best deals (large discounts on electronics) were launched in the AM and burned out quickly, that caused a lot of frustration with customers. This year Amazon a. spread the deals out more evenly through the day and b. the deals seemed much “deeper”. For example, the Amazon Alexa deal was $50 off and the ‘% sold’ only ticked 1-2% an hour so it lasted all day. Amazon has reported this was a record day for Alexa, so they must have had very very very deep inventory on these. We know from 3P deals, they asked for much deeper quantities than past years. Promotion – Amazon really promoted Prime Day at an entirely different level than last year. 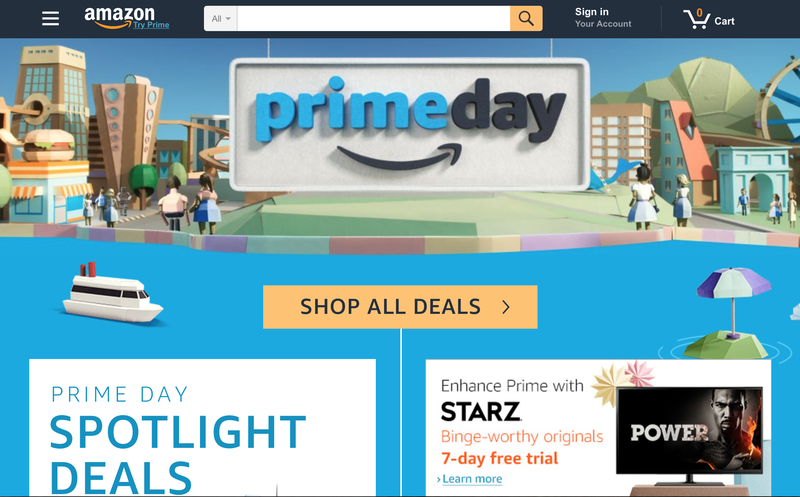 TV spots, digital and my personal favorite – advertising Prime Day on the Prime packing take 5-10 days before the event. Prime Now – APN has a big enough footprint (reaching 80% of consumers based on some Wall St. reports) that Amazon pushed several Prime Day deals through that platform for the first time this year. Like the Alexa promotion, this is a huge benefit to Prime membership and Prime Day is a great way to introduce and activate this Prime feature. The second annual Prime Day was a huge success. Growing a holiday that was already about the size of Black Friday 60% globally, 50% domestically and 30% for third party sales in the middle of July is truly impressive and something that only could be done by Amazon with their Prime subscriber base, private label devices and infrastructure. ← Who Will Become the “Facebook of E-Commerce”?